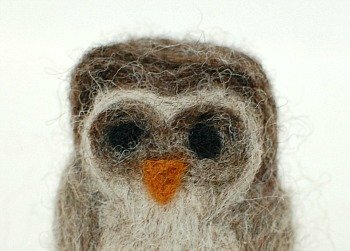 Today I’m going to show you how to make a needle felted owl … so fun! I just love my new woolly friend! 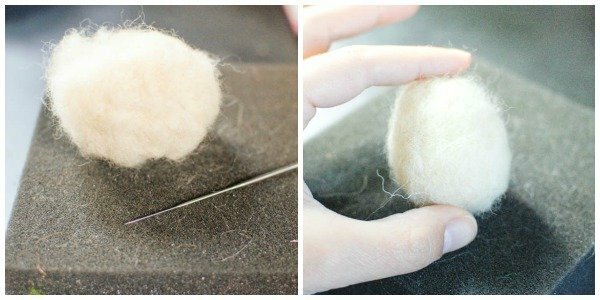 If you need a refresher on needle felting and needle felting techniques, you can refer back to my Needle Felting 101 post here. 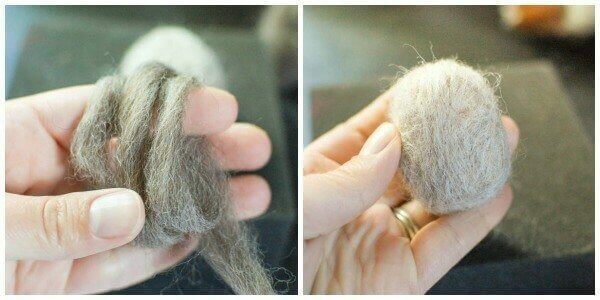 Grab a handful of your wool batting and roll it in your palms to form a ball. Now needle the ball into an oval shape. Don’t needle it too firm because we want to be able to still attach more wool to it. Next, needle one small end flat so the owl could stand up without rolling over. You now have the base of your owl. Now grab a few wisps of your lightest color. 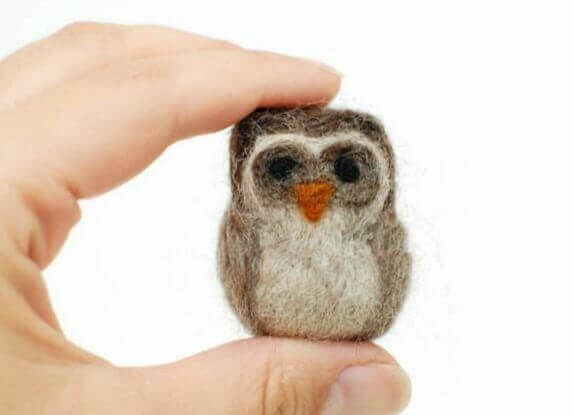 Layer the wisps over your owl base and needle it until attached. 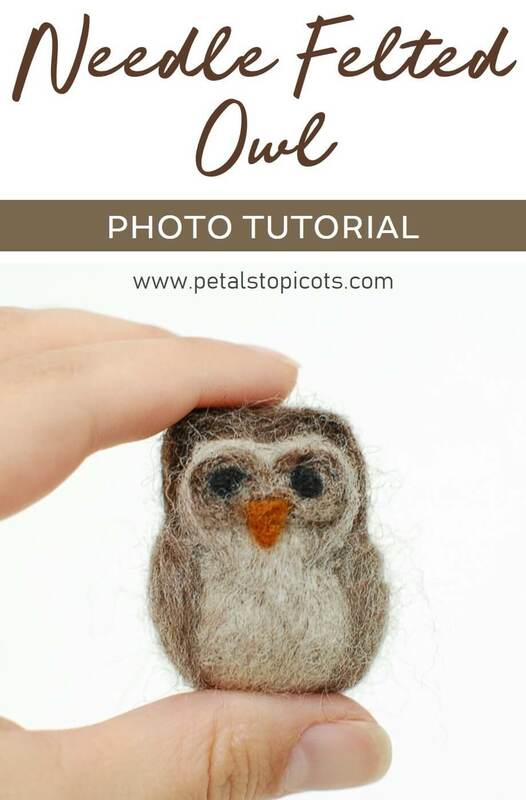 Grab a few wisps of your second color and needle it over the top and sides of your owl. As this point, add a little definition to where the head and the wings of the owl meet by working the area with your needle until you are satisfied with the indent. Grab a small wisp of your last color and needle it around the face of your owl. Make little peaks with the wool to form ears. Now we will work on the details of the face. Grab a tiny bit of one of your owl colors (I chose my darkest one) and needle it onto the face to form two connected circles. Next, needle a tiny bit of black wool into the centers of the circles just made for pupils. Lastly, use a tiny bit of orange wool and needle it into an upside down triangle shape for the beak. I hope you love your new little wooly owl as much as I love mine. 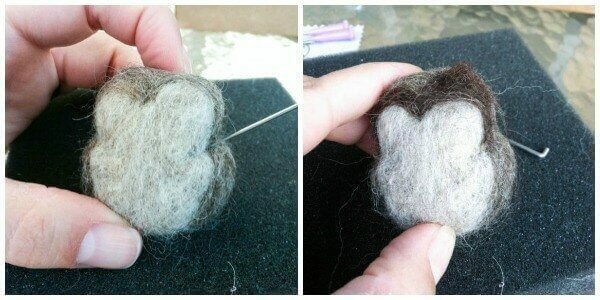 Make sure to check out my other fun needle felting projects here. Oh my goodness how gorgeous. Seriously- one of my fav projects from you! Too cute! Aww he is very sweet! I will have to have a go. This is ADORABLE! I love it, Kara!